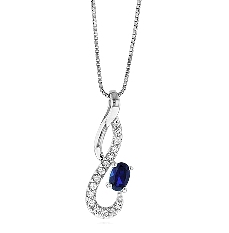 - Chain Fashion pendant features blue oval and white round cut sapphires. - Jewelry is crafted of sterling silver with rhodium plating. One Time Entry. Expires December 01, 2012. U.S. Only.